Donald Trump WAS born in the USA! Donald Trump, the business mogul who continues to claim he is seriously interested in mounting a bid for the White House, says he has doubts about whether President Obama was born in the United States. “Let me tell you, I’m a really smart guy. I was a really good student at the best school in the country. The reason I have a little doubt, just a little, is because he grew up and nobody knew him,” Trump said in the interview that aired on March 17. Obama born in Kenya, mother took him to Hawaii, and registered his birth there. Mexicans do that all the time. 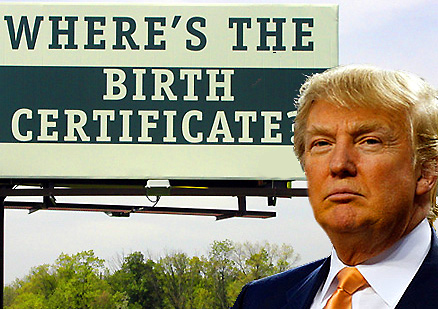 Have the kid in America, and run back to Mexico to get their birth certs. Trump is a self made multi-billionare who had his ups and down. Having a glib tongue and a somewhat charismatic personality, he managed to convince his financial backers (the big time bankers who shared his corporate visions … and dreams) to ride on his visionary bandwagon in the mid nineties. Together they overcame his biggest low point in finance, and has since turned around for better times. He’s a fighter and a survivor. I think he would make a better US president than Obama. Obama is all talk and he had great difficulty in rallying key politicians to his side in trying situations. On the other hand Trump is also all rhethoric but he has the ability to convince his critics and the cynics and has the ability to galvanise support to his cause. I agree. The American media is saying that one of Trump’s big advantages is that he is not a politician. Last night, a reporter said that Trump has already made the decision to run. I think he has what it takes to win.